My friend said they are still out there, but I haven't been out for over a month. Gypsy and her band are on the top of a mountain where the wind had blown the snow off the ridge, and they can get to the grass. He sent me a picture and they looked pretty good, Their long hair covers up their ribs. She should have been on a Center Fold. This colt was so close I turned the flash on, just to see what would happen. Thanks. How close were you to that speed goat when you clicked? Probably about 50 yards, I cropped the picture. Love your centerfold shot of the little filly. 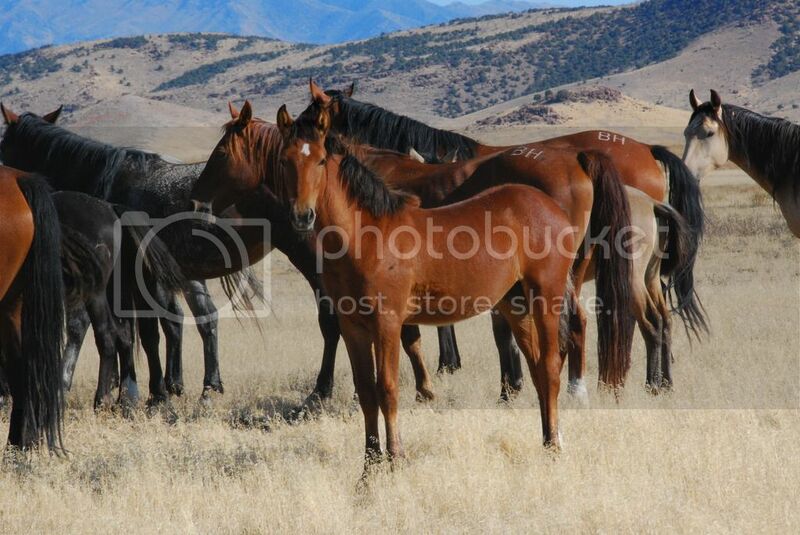 Big Muddy rancher wrote: Love your centerfold shot of the little filly. I agree!! 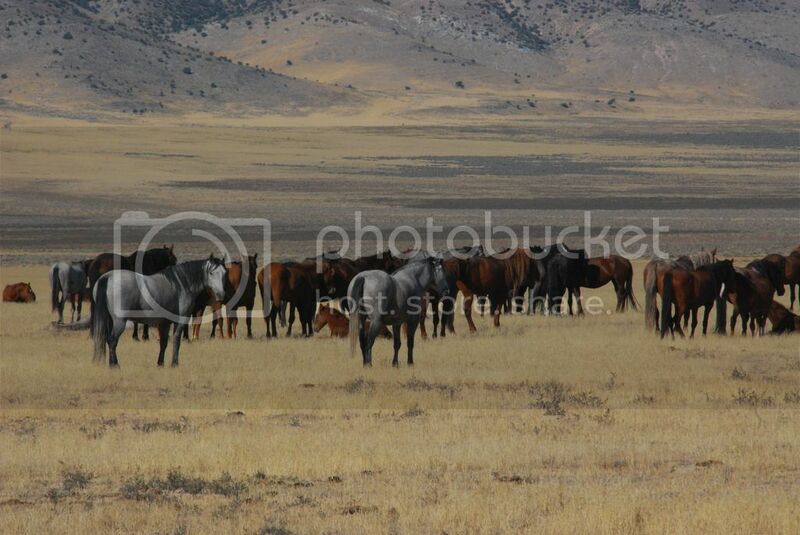 The lighting, the colors of the background, the beautiful buckskin color of the filly....I'm thinking I need this one for our wall to match the one I have! Outstanding! Thanks for the beautiful photo's! 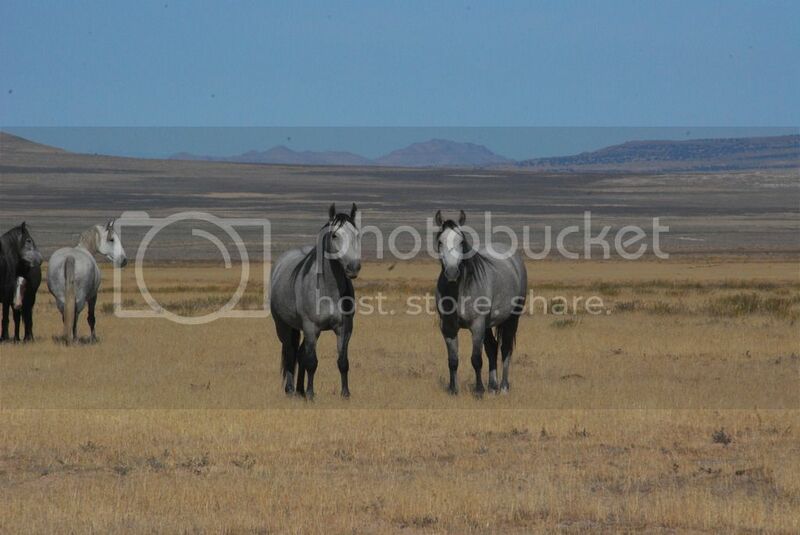 My first favorite is the one of the two gray horses, and I would crop it so it is just those two with the pretty background. My second favorite is the one of the whole bunch. That is just impressive. Wonder how many there are? It is too bad more of the better quality ones, or maybe the beauty is only skin deep, or even in the eye of the beholder, are not tamed and broke to ride. 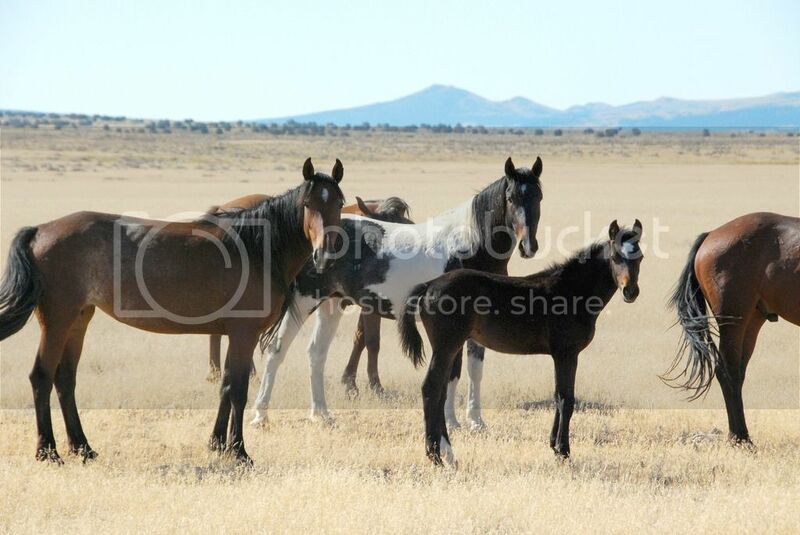 Some of those would be such pretty saddle horses, whether they had any 'cow sense' or not! What a great set of pictures! All of them. The close up colt looks so much like the last filly I raised that it made me do a double-take on that one. Even right down to the stockings. The forehead blaze on mine was a bit longer. The buckskin is a real beauty. The brown stud (guessing he is a stud)sure has a big knee. Wonder if he is crippled? No telling what happened to it. Kicked too many times is a possibility.